I remember when I first discovered David Allen’s book Getting Things Done. I was holding down a challenging corporate job and working on a side hustle. I had a toddler at home and a mountain of stress at work. I was managing a team of writers (this is an oxymoron) and juggling complicated deliverables for customers, coworkers, and executives. And all of those wonderful productivity routines seemed like they were going to make my life simple and stress-free. My Next Actions list fit onto a single page. Mind you, I had to shrink the items down to about 5-point type to get it that way. But I was younger then and my eyesight was still decent, so that was okay. My Projects lists were mighty. My Someday/Maybe lists were even mightier. I judged every day by how well I conformed to my system. Remembered to define my Next Actions and clear out my inbox? I was a hero. Got stuck spending more than 20 minutes on a complex creative task that didn’t really lend itself to a “Next Action” framework? I’d vow to work more wisely next time. That toddler is a delightful, wise-cracking 12-year-old now. The side hustle became a thriving business that eventually became part of Rainmaker Digital. And I don’t spend hours of creatively fertile time working on my productivity system. I don’t blame GTD. It wasn’t the book’s fault, and David Allen is definitely wiser than I am about this topic. But I was spending more creative energy managing my productivity system than I was producing work. And that’s definitely doing it wrong. This time of year, there’s no shortage of miracle systems being offered that will help us quit being such a disaster. There are books and programs and classes and coaches, all vying for your attention to fix what’s horribly wrong with you. I know this because I have long been an enthusiastic consumer of these. But the “secret ingredient” that I found really worked wasn’t in any of those. That “secret” was looking at the reality and individuality of who I am. My goals, my strengths, my weaknesses, and my habits aren’t anyone else’s. So someone else’s system isn’t going to work for me. I think we buy all of that productivity advice so that it will fix us. But we don’t need fixing. When I started to actually produce more work, it was because I recognized that. I didn’t try to squeeze myself into someone else’s system. I took tactics from different places and put them together into my system. Possibly, as we all head into the new year, you don’t need someone to put you into a box with everyone else and their resolutions. Possibly you don’t need to try some kind of do-it-yourself therapy to figure out why you’re always spinning your wheels. To figure out why you’re so screwed up, or why you self-sabotage, or how to fix your insecurities when everyone else is doing great. Possibly you just need to assess your own strengths and weaknesses, figure out what matters to you, and then decide on a handful of habits that can help you do more of the stuff you want to do. 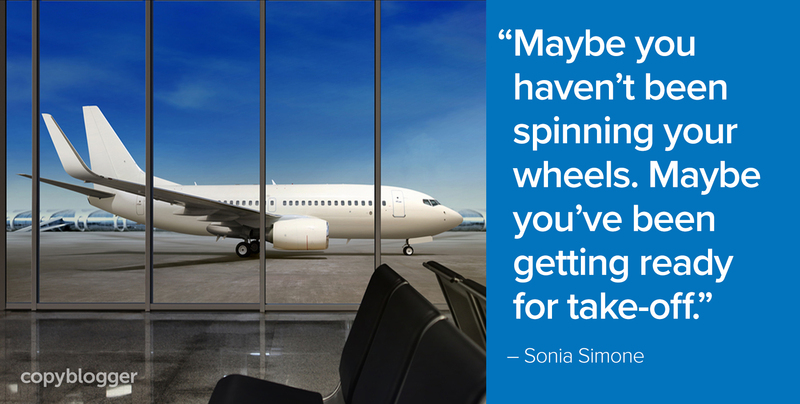 Maybe you haven’t been spinning your wheels, after all. Maybe you’ve just been getting ready for take-off. We’re going to have a resource that might be able to help you out with this. Not by trying to cram you into our version of a perfect productivity system. But by helping you see yourself more clearly (and with a little more kindness), then helping you craft a simple, natural system that works for you and only you. Because if you aren’t the secret ingredient in your productivity formula, no system is going to work for you. It’s called our Creative Foundations course, it’s brand-new, and it helps make sure that all the content you’re creating is built on a solid foundation. Or, keep it simple stupid! Sonia – this is a great post for so many reasons: the pitfalls of other people’s systems, self reflection and understanding that creative output is about all that gets measured. I regret the time I used to write just for others and never thought to build my personal brand. Having a path of productivity is possible if you start doing it for yourself. I have experienced all those juggling days with the unrealistic thoughts in my mind. Maybe something else was required to do so. I find that the best way is to just start instead of fretting over productivity too much! I found a system that works for me through this! Great article, Sonia. There really is no out of the box success system that fits everyone, and to find the right handful of habits that actually keep me motivated has been a huge part of feeling comfortable working remotely and keep me passionate in my hobbies and personal endeavors. I don’t think anyone needs any fixing! And I do believe in the connection of productivity with creativity. I think they go hand in hand. The more creative you are the more productive you can be. You need both, in order to get things done. You need to be creative to find new ways to keep productive. Your creativity is pretty much your imagination. We all have it. It is what makes you daydream and have that vision of you accomplishing your goals in life. I believe we all are productive. And there is not such thing as “procrastination”. What we do have is Priorities. We will work on the things most important to us. We will be productive with the things that matter the most in our life at the moment. Thanks for such a wonderful piece of article, I want to share my perspective that even though you are very creative, but you don’t make that creativity productive you may fail at the end of the day! I’ve always said, awesome is already inside each of us. We just need to let it out. Sonia, I think you hit the nail on the head by saying we have to fit into our own systems by taking bits of others and crafting them around our own creativity.